Between work, school, activities, and social responsibilities, it’s hard for families to spend much quality time together. In fact, unless you make it a habit or schedule it intentionally, for many families it’s a very rare occurrence. That’s why I’ve tried to establish the habit of having dinner together every night and setting aside Friday nights for family time. Sometimes we go out to do an activity together (e.g. dinner, bowling, a movie), but usually we opt for a low-key, inexpensive night in. 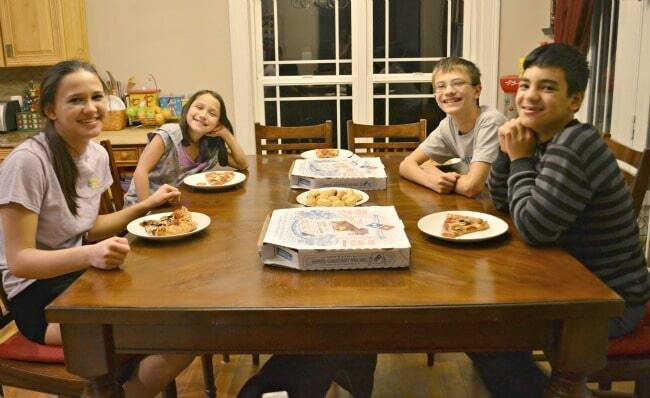 One of our favorite family night themes is Pizza Party Movie Night since I get out of cooking, the kids get one of their favorite foods, we can all relax after dinner, and we get a good 2-3 hours together. Aside from being considerably less expensive than going out to a movie, one of the benefits of watching at home is we can get comfortable by wearing whatever we want and sprawling out on the couch or floor. Also, since we don’t have to worry about irritating people around us, we can talk freely throughout the movie to ask about parts we missed or didn’t understand and to joke with one another. Today I’m sharing some family movie night ideas that turn this unoriginal night in into a memorable evening together. There are several key things you have to consider if you want your family movie night to be more than a family couch potato session. After all, the goal is to spend some quality family time together, right? Set the tone for the night with dinner. If you want to emphasize family time and togetherness, you can prepare a family favorite together. Since our weeks are so busy, I like to set a casual, relaxed theme by ordering in. For our recent movie night, we ordered Domino’s pizzas and parmesan bread bites. For family movie night, one obvious item of importance is choosing the right movie. Family movie night at our house can be difficult since we have to choose one that my 8-year old is just as excited to see as the teenagers are. Since we are watching at home, if we don’t choose well, people wander off before the movie is over. Mission failure. We haven’t had much luck with action movies in the past since they are usually a little too violent or have too much adult content (i.e. boring grown-up conversations) for my youngest child. Family comedies are a good choice. Usually, animated films with adult humor sprinkled throughout are usually our best bet, which is why the Minions movie was an obvious choice for our most recent family movie night. To make movie night stand out from any other night in front of the television, it’s really important to change the ambiance. First, we get comfortable. The girls changed into pajamas. 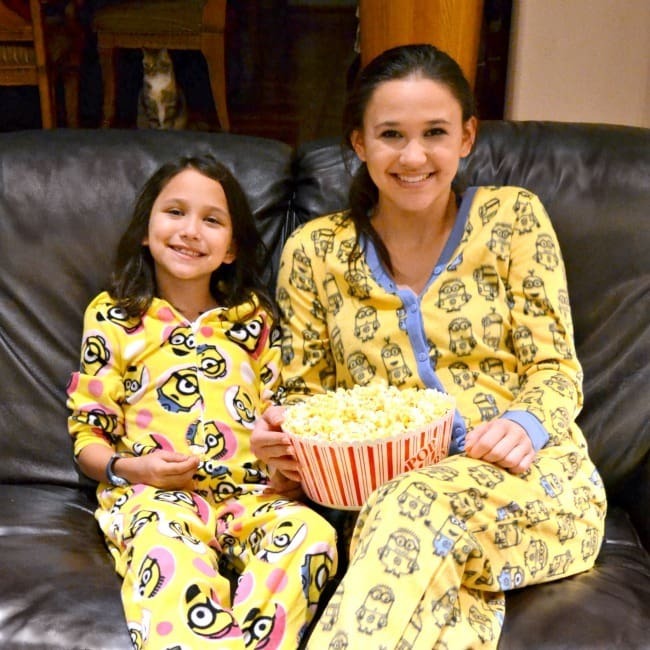 Not just any pajamas–they got into the Minions theme! 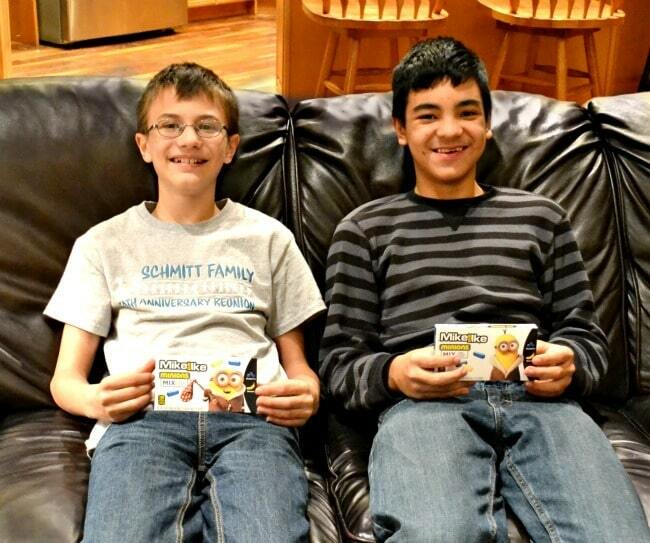 The boys were more comfortable in their jeans and t-shirts. They claimed the other couch for themselves. To recreate a movie theater atmosphere, we set up a concessions area with popcorn and candy. 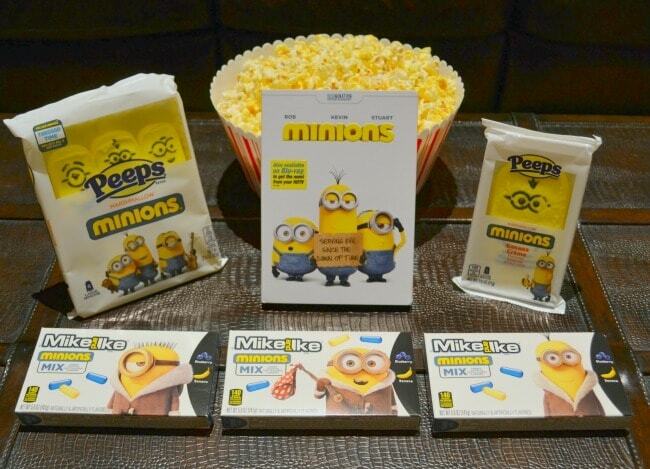 Many thanks to PEEPS & COMPANY® for the Minions-themed treats (along with information and a gift pack) for our movie night! How cute are the Minions Peeps??? My kids LOVED them. Don’t worry, you can get some too! Use discount code SWEETINGS15 to save 20% off your purchase between now and December 31 (no minimum required). We also silenced our phones and turned off all the lights for the movie. Since we aren’t surrounded by strangers at home, we don’t have to stay silent as a courtesy to others. 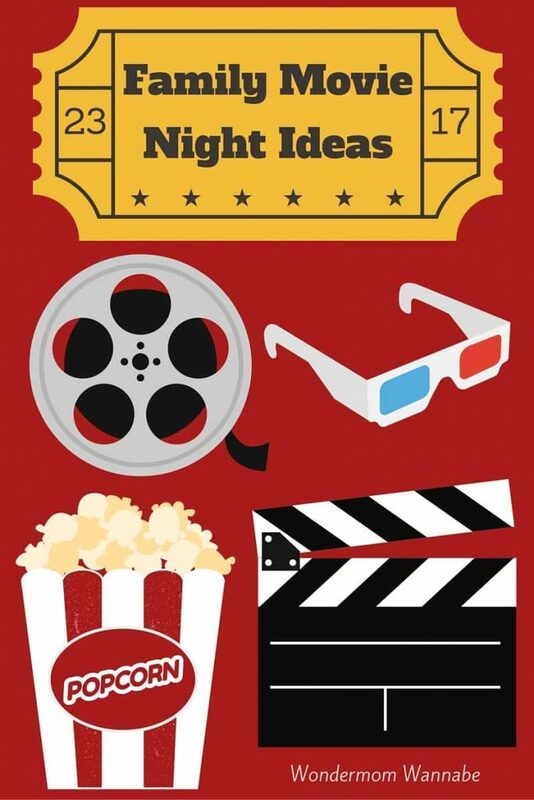 I find that our most memorable movie nights are ones where we talk freely throughout the movie as long as we are talking about the movie or about ideas that are generated because of something that is happening in the movie. Otherwise, we’re all just spending an hour and a half to two hours essentially ignoring one another — NOT my idea of quality family time. That being said, you need to establish an acceptable level of noise and activity or before you know it, the kids are having a pillow fight or talking about something unrelated at school and everyone gets distracted from the movie resulting in an early end to family movie night. We usually do an after-movie recap of our favorite scenes. This is a great way to learn more about one another and to give everyone equal time to express their thoughts. You can also have family members rate the movie. 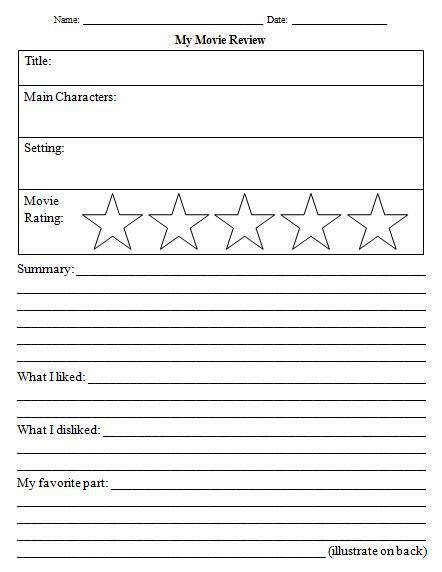 I love this movie review template from Beauty & the Sweets. I had a minion movie night with my kiddos too! It is such a great movie for the whole family. I LOVE the minion pajamas! So cute!